Despite the fact that it is not overly complicated, the setup requires you to pay extra attention to the additional tasks that you want the application to perform. In this sense, you can choose to add the app's directory to your system path, install legacy utilities, associate supported file extensions and install development headers and libraries for C and C++, to name a few. Upon launch, you are welcomed by a rugged and old-school interface, but that is also organized and approachable. Then again, you should bear in mind that most of the functions available within the utility are available via the command line console, an option that can intimidate with some users with less technical skills. The UI can be used to preview the bitmap image you are working on as well as perform minimal editing. As previously mentioned, the main function of the program is to help you convert bitmap images to similar file formats, such as PNG, JPG, JPEG or BMP. At the same time, you can resize, rotate, deskew, flip, trim, add shapes, borders and various special effects like blur, tint, sharpen or threshold to name a few examples. It is worth mentioning that the application also allows you to insert texts, create animations, montages, extract features, connect component labeling, edit complex text layout, access pixels outside the image region, overlap one image over another, so on and so forth. 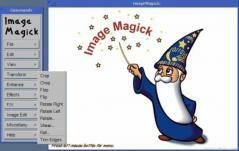 In the eventuality that you are habitually working with bitmap images and prefer a user-friendly and straightforward tool that does not pack too many complicated features and options, then perhaps ImageMagick could lend you a hand.